VIENNA/ROME (Reuters) – Raising the stakes in Europe‘s debt crisis, Austria’s finance minister said Italy may need a financial rescue because of its high borrowing costs, drawing a furious rebuke on Tuesday from the Italian prime minister. Maria Fekter‘s assessment of the euro zone’s third largest economy stoked investors’ fears that Europe is far from ending 2-1/2 years of turmoil – a feeling reinforced by Dutch Finance Minister Jan Kees de Jager, who said the euro zone was “still far from stable”. A deal by euro zone finance ministers on Saturday to lend Spain up to 100 billion euros ($125 billion) to recapitalize its banks was seen by many in the markets as yet another sticking plaster. Spanish 10-year bond government yields soared to 6.81 percent, their highest level since the euro’s launch in 1999. Euro zone rescue funds, already stretched by supporting Greece, Portugal, Ireland and soon Spain, might be insufficient to cope with Italy as well, Fekter said in a television interview on Monday night. “Italy has to work its way out of its economic dilemma of very high deficits and debt, but of course it may be that, given the high rates Italy pays to refinance on markets, they too will need support,” Fekter said. She sought to soften her remarks on Tuesday, saying she had no indication Italy planned to apply for aid. 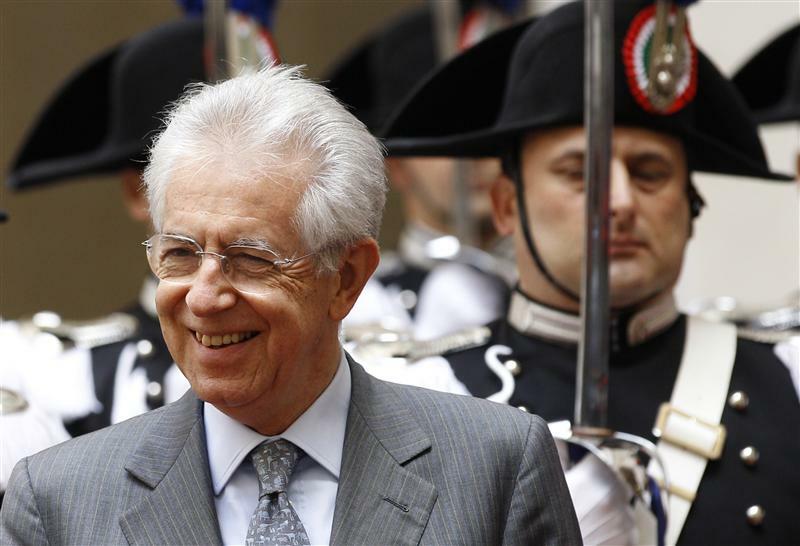 Italian Prime Minister Mario Monti called her comments “completely inappropriate” for an EU finance minister. Euro zone officials said they were deeply unhelpful. Amid the cacophony, Italian 10-year bond yields also rose further as the aid deal for Spanish banks failed to ease doubts about Madrid‘s ability to fund itself, fuelling wider contagion fears. The market reaction suggests that ministers have failed to break the so-called doom loop between rising government debt, economic recession and teetering banks that previously drove Greece, Ireland and Portugal into EU/IMF bailouts. Analysts cited uncertainty about the mechanics of the Spanish rescue and fears that private bondholders could be pushed down the repayment chain below official lenders, risking losses in any debt write-down, as they suffered in Greece. Investors are also worried about the outcome of a Greek general election next Sunday which may determine whether the country stays in the euro zone. Credit ratings agency Fitch said the bank rescue may help stabilize Spain‘s sovereign rating, which it cut last week by three notches to BBB, and the bailout should not have a direct impact on other euro zone countries. Even though Italy‘s deficit and unemployment are lower than Spain‘s and its banks are not exposed to a real estate crisis, doubts about Rome‘s ability to turn itself around during a deep recession are keeping international investors at bay. If the economy does not start to grow after a decade of stagnation, Rome will face mounting difficulty in bringing down its debt, now at 120 percent of gross domestic product – second only to Greece‘s debt mountain in the euro zone. European Commission President Jose Manuel Barroso, European Central Bank policymaker Christian Noyer and French Finance Minister Pierre Moscovici all called on Tuesday for swift moves to create a euro zone banking union. Barroso told the Financial Times that a cross-border banking supervisor, a deposit guarantee scheme and a bank resolution fund could be put in place in 2013 without changing EU treaties. EU paymaster Germany has so far rejected a deposit guarantee or a resolution fund, saying they would require treaty change. The Bundesbank weighed in, saying a European banking union could bring advantages only if properly anchored in a fiscal union with powers to stop countries breaking budgetary rules. Fekter’s typically outspoken comments came after Italy‘s industry minister dismissed the idea that Rome may need external help, saying reforms adopted by his government so far had put the Italian economy on a sound footing. Her concerns are shared by one of the German government‘s council of economic advisers, Lars Feld, who told Reuters that Italy could be next in line. “Overcoming the troubles in Spain will bring calm to the markets for a while, but the chances are not so small that Italy may also come under fire, in particular as the promised labor market reform has turned out to be less ambitious,” Feld said. The Austrian minister has a track record of speaking out of turn. She angered EU paymaster Germany last month by suggesting Greece might be forced out of the European Union over its economic problems. She infuriated Euro group chairman Jean-Claude Juncker in March by rushing out to brief the media on a deal to increase the euro zone’s financial firewall before he could make the official announcement. She later apologized. And when U.S. Treasury Secretary Timothy Geithner was invited to a euro zone finance ministers’ meeting in Poland last year to plead for a more robust rescue fund, Fekter said bluntly that Washington should look after its own worse fiscal mess first. In Brussels, EU officials voiced exasperation at her latest comments on Italy. Italy‘s leading economic newspaper, Il Sole 24 Ore, appealed to Germany to save the single currency before it is too late. “Schnell Frau Merkel! (Hurry Up Mrs. Merkel! ),” the usually sober business daily said in a banner headline in German. An editorial urged Chancellor Angela Merkel to back joint guarantees for European bank deposits, allow direct access for banks to euro zone rescue funds and accept a mutualisation of European public debt, with each country paying a different interest rates. Merkel has opposed issuing joint euro zone bonds and says member states must agree to transfer more budget sovereignty to European institutions, including the EU’s Court of Justice, as part of a political union before she would consider such idea.